This anime is terrible, I would give it a -10/10, but unfortunately MAL's scoring system does not go that low. A disgusting display of mindlessness, no real direction as it is just a bunch of Pokemon running around. Worst of all the 10 minute segments are completely squandered, there could have been real character development, when will Pikachu grow up and become a real man. Ok, Ok, I'm just kidding there, now for the real review. 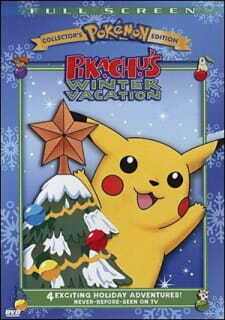 This is a Pokemon Christmas special that focuses on the Pokemon themselves rather than the Trainers. It is basically the Pokemon getting into all sorts of cute hi-jinks. There is not deep story, and the animation and art is about as good as you'd expect from anything from the Pokemon franchise. I am not a fan of Pokemon at all but I enjoyed this quite a bit. It's cute and entertaining. It really isn't something that needs your full attention, which would make it ideal for putting on while you and your kids wrapped presents or decorated the Christmas tree. All and all a bit of inoffensive holiday fun that kids and Pokemon fans are sure to enjoy.